Following Gov. Palin’s speech at Stanilaus last night, several reporters made disparaging remarks about her not knowing or caring the mic was open. Full of snark, they quipped about how it was “not possible to capture dumbness in two soundbites.” Apparently, it is possible, because these reporters just did, capturing their own rank stupidity on an open mic. We can only guess what kind of dispatches these “objective” reporters filed. This behavior is precisely why they are called “lamestream”. If these reporters so could not stand Gov. Palin, they had an obligation to recuse themselves. A reporter’s job is to cover the news, not broadcast snarky opinions on an open mic. This video captured an egregiously unethical, and unprofessional act. These reporters should be fired. Sarah Palin “Polarizing”. To Whom? “Polarizing” is rapidly becoming the favorite term for detractors of all things Palin, especially in news coverage prior to her speech last night at California State University at Stanislaus in Turlock. “Whether you love her or loath her, this polarizing Sarah Palin is pushing forward here at CSU Stanislaus, helping celebrate 50 years of education here, preps are being made for the event, but tonight a Senator is calling her out,” said Jonas Tichenor. The “calling out” Senator is none other than California State Senator Leland Yee, whose anti-Palin tirades were covered by Stacy Drake, in Brown Plays Dirty Politics with Palin Speech, Says… HuffPo?, The California Persecution of Sarah Palin, and CA Lawmaker Targets Palin, Proves Why State is Such a Mess. CA State Senator Yee’s Anti-Palin Jihad – Who’s the Polarizing Figure? If we refer back to the Tichenor paragraph, CSU was happy to have Gov. Palin speaking on June 25. Her presence raised over $200,000 for the school – the point of her being there in the first instance. CSU arranged for her services through the Washington Speakers Bureau. Yes, Gov. Palin is getting paid for her work, as she should be. CSU raised money; Gov. Palin earned her pay. It’s all good. It is State Senator Yee and Gov. Palin’s enemies – who are many in liberal San Francisco – who polarized the whole situation with their antics. The Modesto Bee account of Gov. Palin’s speech reports that it was a smashing success. Gov. Palin netted the university over $200,000, the most ever raised in a single event. People paid $500 to see her and her speech on education and freedom was punctuated by standing ovations. 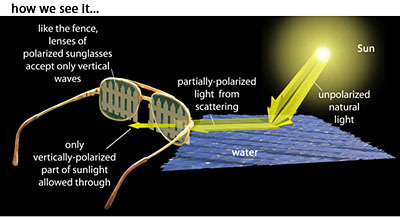 How “polarizing” is that? Of course, we expect that leftists will find Gov. Palin “polarizing.” In this instance, the more “polarizing” she is the better! Gov. Palin is “polarizing” because she honestly, openly, and transparently cuts through the bull, and clarifies precisely what is wrong with their ill-conceived policies. But the leftist party machine is not the only party machine Gov. Palin has a long and proud history of bucking. Thus, we frequently see anti-Palin “conservatives” using “polarizing” in reference to her. They do so usually because their dream candidates did not secure an endorsement, or perhaps because Gov. Palin might actually run in 2012, thus denying the nomination to many other “great leaders” the GOP has to offer. Her “conservative” detractors also know that Gov. Palin would put an end to much of the chicanery within the party machine, thus upsetting their little apple carts. To a one, those who find Gov. Palin “polarizing” either have a clear, present and vested financial or political interest to which Gov. Palin is a real or perceived threat or they have had their little political racket busted up by her and carry a grudge. Common-sense Reagan Conservatives rally around Gov. Palin, which is probably most “polarizing” of all. 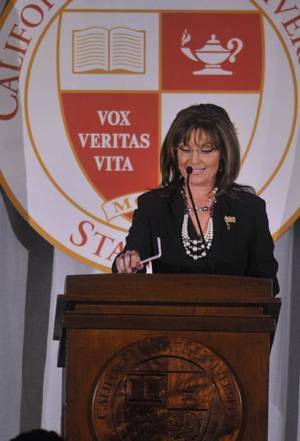 Governor Palin was well-received by the attendees at the soldout CSU Stanislaus gala at which she spoke last night. She gave an excellent speech, full of substance and lightened with humor, that appealed to the academic community to be part of the solution in getting America back on the right track. A 34-minute video of her speech can be found here. Her visit was met by a daylong protest; about 100 critics chanted slogans and carried signs labeling her “Sinister Sarah.” Another crowd carried signs supporting Palin. Inside, a prolonged standing ovation greeted the former Republican vice presidential candidate and Alaska governor as she entered the dining area. She repeatedly referenced Ronald Reagan’s optimism. She said she felt a kinship with the farmers in the room because she’s the owner of a family fishing business. She called for a return to common sense in the country and took President Obama to task for what she sees as soft views on the war on terror and immigration. “We must embrace our entrepreneurial drive, and allow America to remain the world’s standard-bearer for excellence,” she said. Palin took a shot at those who have launched an investigation into the finances of the university’s nonprofit foundation in response to her confidential contract. Her presence kept Turlock buzzing throughout the day. Even as waiters set the tables, protesters gathered and the guest of honor landed in Modesto, people were trying to get into the dinner. “My phone has been ringing off the hook all day with people still wanting tickets,” Foundation President Matt Swanson said Friday afternoon. The gala brought in $450,000 gross. University officials estimated they spent $190,000 and got $50,000 in in-kind donations, such as drinks and supplies. Black, gold and crystal table settings, white flowers, lights and gauzy drapes transformed the university’s cafeteria for the $500-per-ticket event. Swanson said the foundation sold about 370 tickets, in addition to several higher-priced sponsorships. Guests dined on a five-course dinner that included buckwheat blini with smoked salmon, caprese salad, seared scallops and filet and halibut. They were greeted with a signed copy of Palin’s autobiography, “Going Rogue,” on each seat. The next most successful fundraiser — outside of donations for buildings, endowed chairs and the like — was a concert by actor Gary Sinise’s band that grossed $200,000, Swanson said. A third of the proceeds immediately will go toward scholarships, Shirvani said. He will consult with his development team on what to do with the rest of the money. “We have so many needs,” he said.